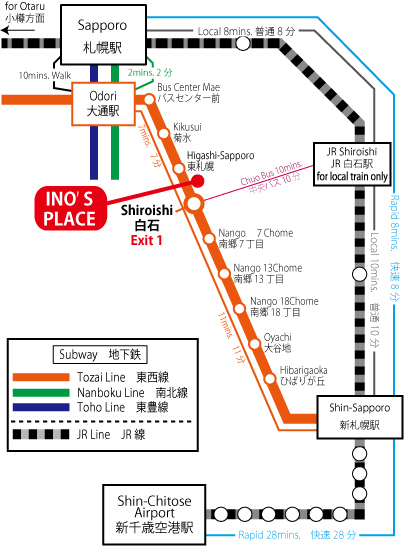 Please notice that "JR Shiroishi station" is NOT CONNECTED to "Subway Shiroishi station", those stations are separated as the closest station from our hostel is "Subway Shiroishi station". Please use EXIT 1. 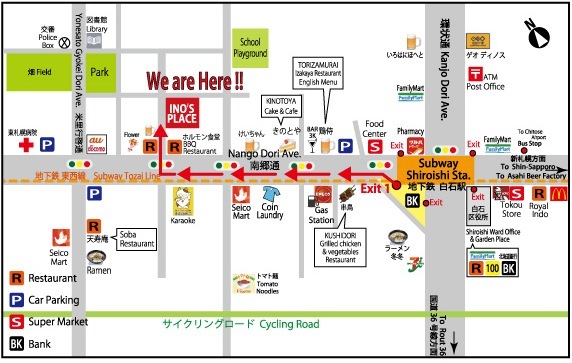 At the top of the stairs, go straight along Nango Ave. St. towards 'ENEOS G.S' (Odori Park direction). It takes about 6minutes on foot from Shiroishi station. Please feel free to call us, if you get lost. It takes about 90 mins. It takes about 9 hours from Tokyo Sta. to Sapporo Sta. Please seaching JR train time scedule in Japan by this website. It takes about 19 hours. From Tomakomai Sta. to Sapporo Sta. Please check ferry campany website.